Radomil Eliška was born in 1931 at the Czech Republic and studied conducting at the Janáček Academy of Music in Brno (JAMU) with Professor Břetislav Bakala, direct disciple of Leoš Janáček. From 1969 to 1990, Eliška was the Principal Conductor and Music Director of the Karlovy Vary Symphony Orchestra in the Czech, the distinguished orchestra known for playing the European premiere of Dvořák's Symphony "From the New World." In 1978, he was also invited to teach conducting at the Academy of Music in Prague (AMU), where he taught for 33 years, within which the last 17 years as the college professor. From 2001 to 2013, Eliška was the President of the Czech Antonín Dvořák Society. 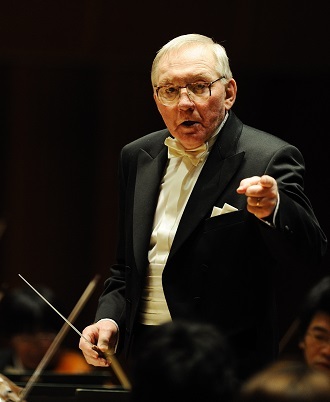 As a guest conductor, he conducted the Czech Philharmonic and almost all the orchestras in Czech, as well as appeared in Prague Spring International Music Festival. As guest conducting, he was also invited to Germany, Austria, Spain and former Soviet Union. His debut performance in Japan was in 2004. Eliška made his first performance with the Sapporo Symphony Orchestra in 2006, and was appointed the Principal Guest Conductor of the orchestra in 2008, and in 2015, appointed the Honorary Conductor. Live performances of Dvořák's Symphony No. 5 to No. 9 were released, and the combination of Eliška and the Sapporo Symphony Orchestra was reviewed with much enthusiasm. His charms expanded beyond Czech music and projects on Brahms cycle and Tchaikovsky's three major symphonies were carried out. October 2017, against the instructions given by his medical doctor, Eliška made his last trip to Japan and presented "Scheherazade" with the orchestra.